For the cities named San Juan worldwide, see San Juan (disambiguation). "San Juan City" is a contraction of the city's traditional name of "San Juan del Monte" (lit. Saint John of the Mountain). As with numerous other places in the Philippines, the name combines a patron saint and a toponym; in this case Saint John the Baptist with the locale's hilly terrain and relatively higher elevation compared to surrounding areas. The city's official name is "Dakilang Lungsód ng San Juan" (lit. Great City of San Juan). During the pre-Hispanic period, the area of what is now San Juan was a part of the Kingdom of Namayan, whose last recorded rulers were King Lacantagean and his consort, Bouan. After the kingdom and other polities in the islands were absorbed into the Spanish Crown in the late 16th century, the realm of Namayan was christened Santa Ana de Sapa. The present area of San Juan was meanwhile re-classified as a barrio, becoming a small encomienda by 1590. In 1602, the Dominicans built a retreat house in the vicinity for their immediate use, where ageing or convalescing friars stayed. Later, the Order constructed a convent and stone church dedicated to the Holy Cross. To this day, the thrice-rebuilt Santuario del Santo Cristo stands on the same site, adjacent to Aquinas School and Dominican College. In 1783, San Juan was partitioned from Santa Ana but was still a barrio within the Province of Manila. The El Deposito reservoir was historically known as the site where the onset of the Philippine Revolution through the Battle of San Juan del Monte took place in 1896. The opening salvo against Spain took place in San Juan in 1897 when the Katipunan attacked the alamacén (armoury) or polvorín (gunpowder magazine) of the Spanish East Indies colonial government. The town was later incorporated into the Province of Rizal in 1901 under American military rule. On 7 November 1975, President Ferdinand Marcos signed Presidential Decree No. 824 that established the National Capital Region, and San Juan was among the towns excised from Rizal Province. Residents ratified the conversion of the municipality into a highly urbanised city on 17 June 2007, pursuant to Republic Act No. 9388 ("An Act Converting the Municipality of San Juan into a Highly Urbanized City to be known as the City of San Juan"). Then Congressman Ronaldo B. Zamora sponsored the Cityhood Bill in the House of Representatives and worked for its approval. Although not officially designated as such, San Juan is noted to be the "Town of Philippine Presidents." Four presidents since the Third Republic were official residents of San Juan when they assumed office. They were the Macapagal père et fille, Diosdado Sr. (1961–1965) and Gloria Arroyo (2001–2010); Ferdinand Marcos (1965–1986); and Joseph Estrada (1998–2001), who also served as Mayor when San Juan was still a municipality. San Juan is the least extensive city in the Philippines with a total area of 595 hectares (2.30 sq mi). The territory of San Juan was once much larger than it is now, extending all the way to what is now Caloocan City. Parts of the present-day Districts 1, 4 and 6 of Quezon City as well as areas of Mandaluyong were originally within the town's colonial-era borders. This also explains why San Juan Reservoir is in nearby Horseshoe Village, a subdivision now part of Quezon City. The J. Ruiz station is the only rail and rapid transit station serving San Juan. Modes of public transportation in San Juan include jeepneys and buses. Jeepney routes ply the Aurora Boulevard (R-6). The city is serviced by the Line 2. The only Line 2 station in San Juan is the J. Ruiz station. The C-3 (Araneta Avenue) also passes through San Juan. Secondary routes include Nicanor Domingo (abbreviated N. Domingo), which heads towards Cubao in Quezon City, and Pinaglabanan/Santolan Road, which leads towards Ortigas Avenue and eventually the southern reaches of Quezon City near Camp Crame, the headquarters of the Philippine National Police. The Polytechnic University of the Philippines maintains a campus in San Juan. OB Montessori Center is the main campus in Greenhills. The city also has several notable places of worship. Saint John the Baptist Parish, more commonly known as "Pinaglabanan Church", is where the city's patron saint, John the Baptist, is enshrined. The Santuario del Santo Cristo is the settlement's oldest existing church, while Mary the Queen Parish in West Greenhills serves the local Filipino-Chinese community. From 1925-1971, the Iglesia ni Cristo once headquartered in the town at its former Central Office Complex, now known as the Locale of F. Manalo. It features Art-Deco designed ensembles, crafted by National Artist for Architecture Juan Nakpil. The Chapel is the centerpiece of the Complex, which also contains the old Central Office and Pastoral House which was the home of the church's first Executive Minister, Ka Felix Manalo, along with other Ministers and Evangelical Workers. When Manalo died in 1963, a mausoleum was constructed on the grounds of the Complex by architect Carlos Santos-Viola. San Juan also has a number of Evangelical churches. Through the APOI ( Association of Pastors for Outreach and Intercession), they have contributed to the spiritual atmosphere of the city. Every January, the city celebrates the National Bible Week, where the reading of the Scripture happens during the flag raising ceremony in the City Hall. Through the blessing of the mayor, a bible was planted in the heart of the new city hall during its construction. Major evangelical churches like Jesus is Lord, Victory Greenhills are also found in the city of San Juan. ^ Councilors of San Juan, Metro Manila. ^ "Province: NCR, SECOND DISTRICT (Not a Province)". PSGC Interactive. Quezon City, Philippines: Philippine Statistics Authority. Retrieved 12 November 2016. ^ a b c Census of Population (2015). "National Capital Region (NCR)". Total Population by Province, City, Municipality and Barangay. PSA. Retrieved 20 June 2016. ^ "A short and sweet historical tour of San Juan City - The Manila Times Online". www.manilatimes.net. Retrieved 2018-07-26. ^ "National Historical Commission of the Philippines official website". Pinaglabanan Memorial Shrine. 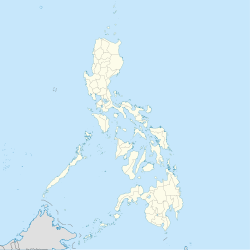 ^ "Province of Metro Manila, 2nd (Not a Province)". Municipality Population Data. Local Water Utilities Administration Research Division. Retrieved 17 December 2016. ^ a b "US-Asia Sister Cities by State". Asia Matters for America. Honolulu, Hawaii: East West Center. Retrieved 2015-02-04. ^ "San Juan, Philippines & Maui, Hawaii". Washington, DC: Sister Cities International. Retrieved 2015-02-04. ^ "Socal Sister Cities Directory". Southern California Sister Cities Directory. SoCal Chapter Inc. Retrieved 2015-02-05. ^ "San Juan, Philippines & Santa Barbara, California". Washington, DC: Sister Cities International. Retrieved 2015-02-04. Wikivoyage has a travel guide for San Juan (Metro Manila). Wikimedia Commons has media related to San Juan City.